Tried diving for bugs from the yak today for the first time. Success. Got a quick limit, and threw back a few keepers to get at the biggins. They were all caught in 6-8' depths, good for me since I'm not much of a diver. Nice catch. A buddy of mine does bully netting at night in the bay, and he does very well also. Bully netting from a yak? I want to try it, not sure how feasible it is seated in a kayak though. Try a paddle board. It would be great for bully netting. 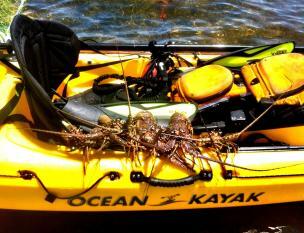 took my kayak out of boca inlet today. patch reefs in around 25 feet. visibility was awful. hard to see what i was over. bottom visibility eventually went downhill too. got four bugs. two big dudes and two legal. its a long paddle and swim lol. do it all the time though. aint paying 16$ to park at red reef or spanish river when silver palm is free, even if it adds a few miles each way. gave my heads to a guy pulling his boat out for chum. always down to go with others. Nice to see that you only keep what you can.You never know when FWC might show up and give you a fat ticket.